www.rbi.org.in. RBI official web link opens from 17-11-2017 to 07-12-2017. 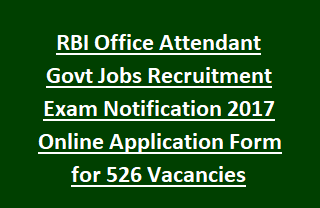 Selection of candidates for these RBI Office Attendants vacancies will be based on Online Test and Language Proficiency Test (LPT). Online Test will be held in the month of December-2017/ January 2018. Last date for the Payment of Test fee through online is 17-11-2017 to 07-12-2017. Age of the candidate should be between 18 years to 25 years. Find the details of Vacancy, Application Procedure, Selection Process, Age details, Pay Scale of Reserve Bank of India RBI Office Attendant Jobs Recruitment Exam 2017 are given below. Online payment of RBI exam fee starts from: 17-11-2017 to 07-12-2017. Total available vacancies in Reserve Bank of India RBI Recruitment Exam Notification are 526 posts. Post Name: Office Attendant: 526 posts. 4. Chandigarh: 42 posts & Shimla: 05 posts. 13. Mumbai: 144 posts, Navi Mumbai (Belapur): 15 posts & Panaji: 06 posts. Candidate must have qualified 10th class (SSC/ Matriculation) from the concerned state/ UT. Candidate must be proficient in concerned language. Reserve Bank of India RBI Recruitment Selection will be based on Online Test and Language Proficiency Test (LPT). Online Test consists of 120 questions. Time duration is 90 minutes. For each wrong answer 1/4th mark will be deducted. - Reasoning: 30 questions- 30 marks. - General English: 30 questions- 30 marks. - General Awareness: 30 questions- 30 marks. - Numerical Ability: 30 questions- 30 marks. Qualified candidates in online test will be displayed on RBI official website and would be send to Language Proficiency Test. Final merit will be prepared based on candidate performance in online test, LPT, Medical Fitness Test, Documents Verification and Biometric Data etc. Online Test will be held in the month of December 2017/ January 2018. There is no application fee and intimation charges for Staff Candidates. Eligible candidates may go to the Reserve Bank of India official website www.rbi.org.in. Click on the desired post. Enter the tab for new registration. After registration process fill the application form and submit from 17-11-2017 to 07-12-2017.